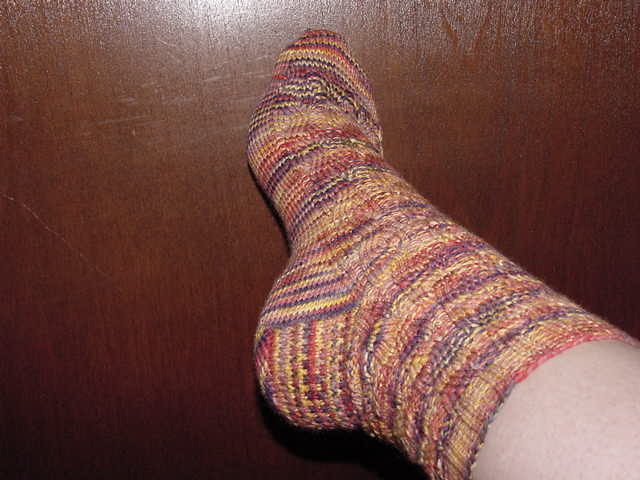 It took a while, but here is my first sock named Fawkes. 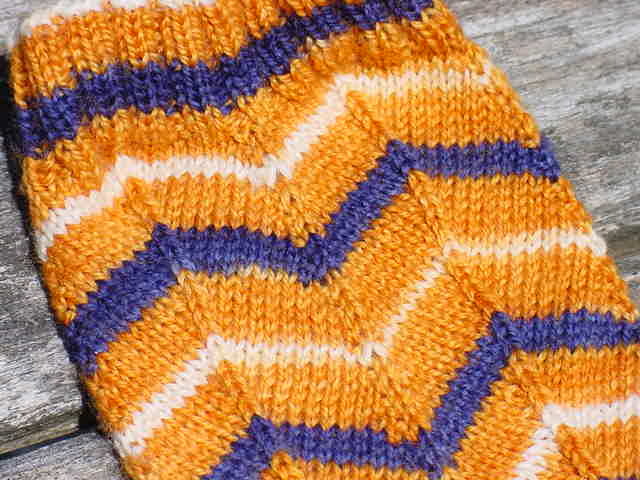 The pattern is River Rapids, by SockBug. The first picture shows the color more accurately. I'm not sure when sock number 2 will come along...by fall, I think. Right now, I've been working on getting some things out of the WIP basket! For my Amazing Lace Challenge entry, I have chosen to do haiku. A trio, if you will. why do we knit lace? Time to share some pics of what I did while I was out of town last week. In no particular order, you will see the start of the Wobbly Circles Tote (to be felted), the start of ChicKnits' Ribby Cardi (my first sweater), the Illini Jaywalker-in-progress, the start of a Mock Croc Sock, a completed Chameleon sock and the finished Moderne Baby Blanket. I'll provide more details on all of these, but for now I wanted to get the pictures up. What are your favorite colors? I like most colors, actually! I'm not a big pastel person, though. I gravitate toward autumnal shades, but I'm open to just about anything. Are you a new sock knitter? 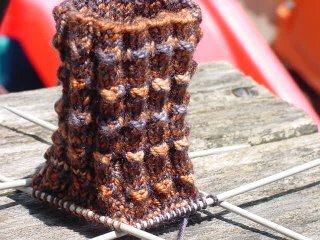 How long have you been knitting socks? I'm not really a new sock knitter - I tackled socks fairly soon after I learned to knit. That being said, I've only been knitting for less than a year. 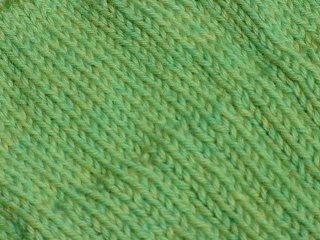 Do you prefer solid or multicolored yarn? I like both. I only have one solid (orange), everything else I've bought is multi/variegated - so I'm open to whatever you'd like to send! What are your favorite sock knitting patterns? 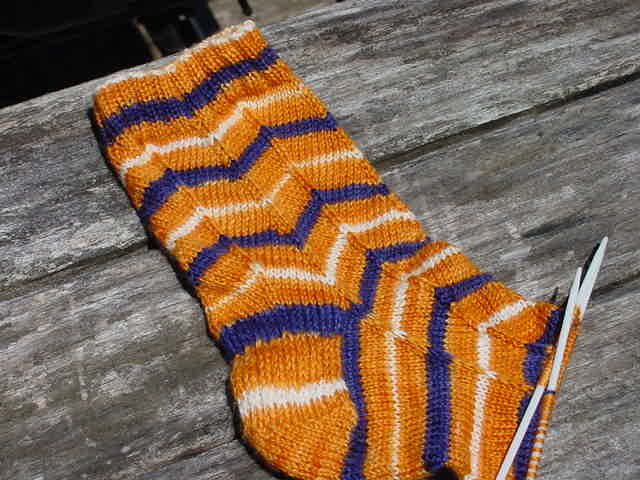 Jaywalker, Pomatomus, the Sock Bug patterns...so hard to pick! Do you prefer circulars or dpns for sock knitting? I like them both! 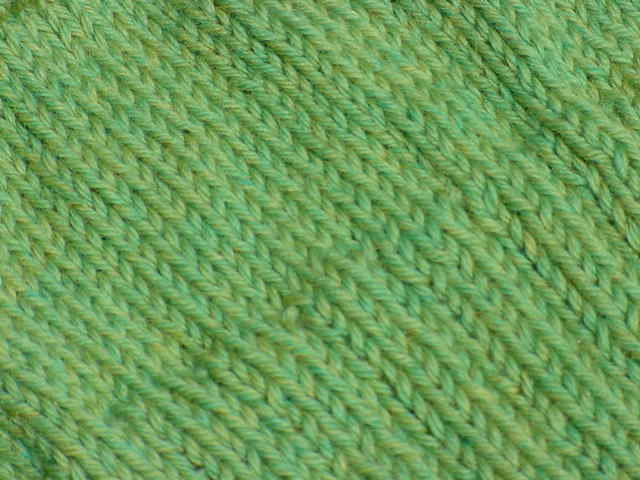 What are some of your favorite yarns? I'm not that picky, LOL! 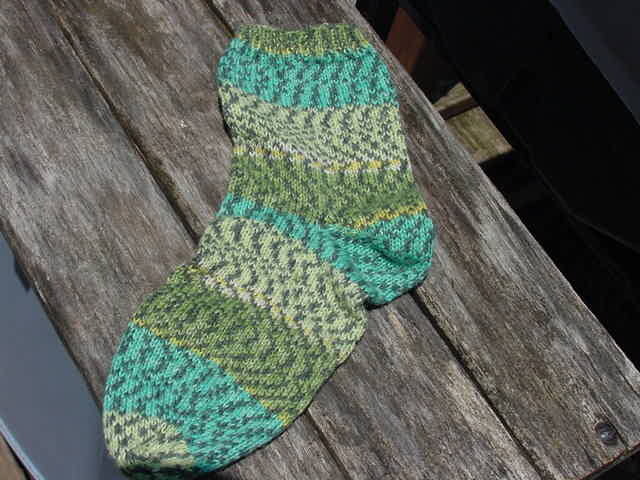 I DO NOT like Sockotta and I'm not all that excited about Cascade Fixation either. Any pattern you would love to make if money and time were no object? doesn't really apply...if I want to do it badly enough, I'd do it! Favorite kind of needles (brand, materials, straights or circs, etc)? I do love Addi Turbos (already have sz 1 and 2). Most of my dpns are Clover brand, which is fine, but I do have some Inox dpns and the short Bryspuns. I'd love to have some Lantern Moon needles! If you were a specific kind of yarn, which brand and kind of yarn would you be? I'd most likely be Socks That Rock. Do you have a favorite candy or mail-able snack? I love chocolate, but it's not great for mailing in the summer! I do love Starbursts. Surprise me! Just no coconut, please! What’s your favorite animal? I love most animals - no particular favorites! Do you have pets? What are their species/names/ages? I have a dog, Maggie. She's a Schipperke mix, age: almost 8. If you were a color what color would you be? orange! if not orange, then green. Describe your favorite shirt (yours or someone else’s).. ??? Tell me the best quote you’ve ever heard or read. "There is some crap, up with which, I will not put." Anything else you’d like to share with the group today? nope! but feel free to ask questions if you have any! I really am still here...just haven't posted this week. Still knitting. 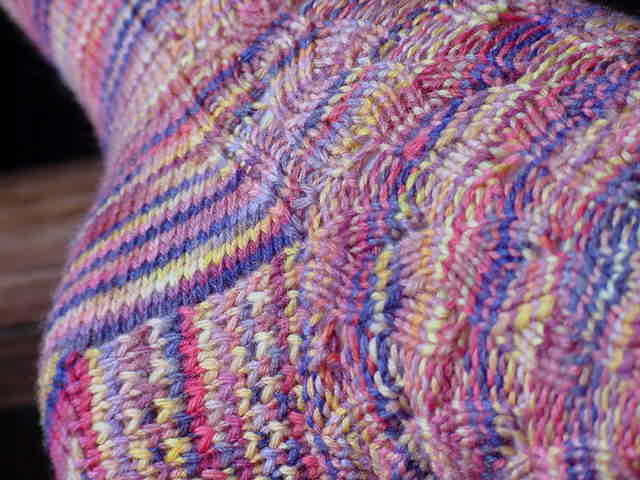 Almost finished with the Moderne Baby Blanket from Mason-Dixon Knitting. 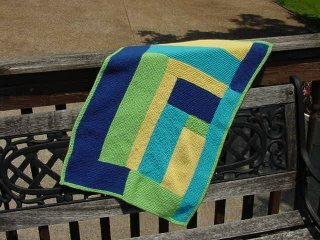 Good pattern, great gift, just wish I hadn't messed up (interpreted "garter ridges" as rows, so blanket isn't as big as it should be)...it's fine, though. 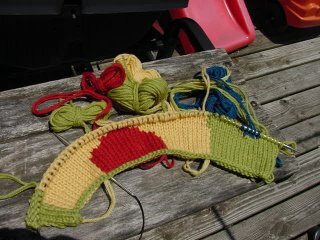 I'm picking up stitches for the final "block" and then I just have a small border to do. I was hoping to be finished with it before I leave town, but I'm not sure that will happen since I do need to clean and pack and stuff. Yes, leaving town...the kids and I are going to visit my parents for just over a week! Should be fun. Not terribly relaxing for me since my parents can't be total grandparents (they are raising twin girls, age 6, my cousin's children...very long story), but it will be good. I really need a change of scenery right now and this will be just the thing! Of course the biggest dilemma now is what knitting to take. This is a new problem for me since I was still a very new knitter the last time I traveled (at Christmas). 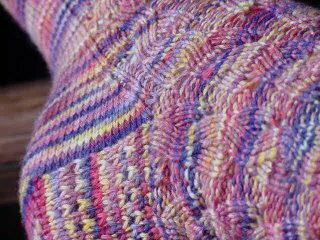 I know the Pinwheel Shawl will be coming, as well as some socks...but what else?? I'm thinking it's time for the Wobbly Circles Tote. It's a good chunk of yarn to bring along, though. But wouldn't it be great if I could do it start-to-finish next week?? Hmm...so many choices. The good news is that since my parents are coming to get us (and bring us back - we only have one working vehicle right now), I should have plenty of knitting time in the car since it's a 6-hour drive from door to door. 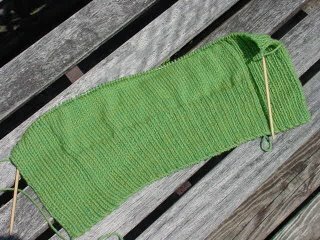 So yeah...I'm open to suggestion on what to take knitting-wise. Like I said, Pinwheel and socks definitely. Other options would be stuff for more mitered squares...cotton for dishcloths...more sock yarn to play with designing my own pattern...oh yeah, and the Wobbly Tote.